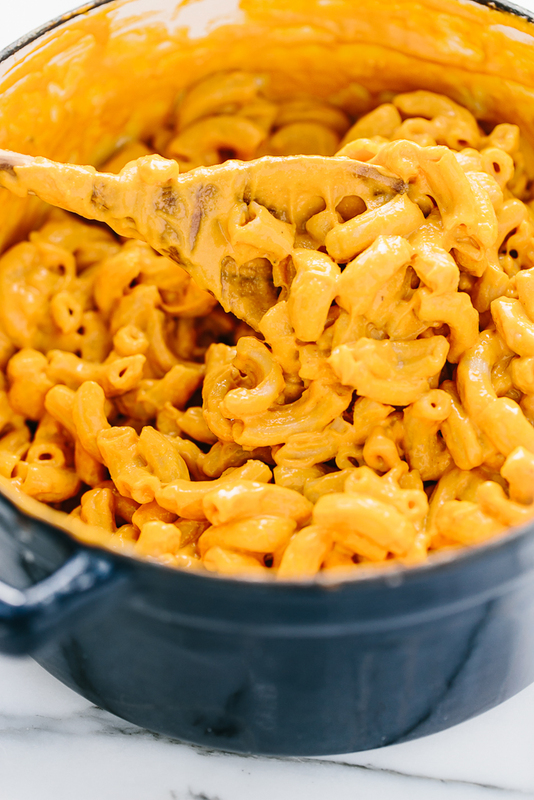 This smoky vegan macaroni and cheese is the ultimate comfort food. 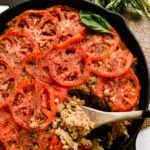 It’s rich, ultra cheesy, made with whole plant-powered ingredients, and it comes together in a speedy 30 minutes flat. 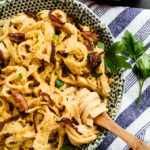 Heaps of warm elbow pasta tossed in spoonful after spoonful of gooey cashew cheddar cheese. It’s hard to compete with this deeply comforting dish when faced with icy cold winter weather and snow. 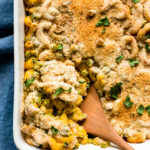 Other than sharing Gena’s lovely butternut squash mac ‘n’ cheese recipe back in the fall, this is actually the first vegan mac and cheese dish I’ve ever shared. It was worth the wait for me, and I have a hunch you’ll feel the same (or at least I hope). To make it, you’ll start by cooking up a bit batch of elbow pasta. I use brown rice pasta, but feel free to use whichever kind your mac ‘n’ cheese heart desires. While the pasta is cooking, you’ll get to work on the cashew cheddar cheese sauce. You’ll blend together soaked raw cashews, filtered water, roasted red peppers, nutritional yeast, arrowroot powder (a root-derived thickening agent), apple cider vinegar, lots of smoked paprika, sea salt, black pepper, and an optional dash of both cayenne and hot sauce. 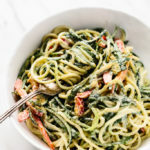 It will initially seem like there is wayyyy too much sauce, but the noodles will draw it in as you stir and trust me, you’ll want every bit of it. The final step: taste and season with a bit more sea salt, black pepper, and smoked paprika. The smoked paprika weaves a savory smoky flavor throughout, so if you want to up the smokiness even more, go on and get shaking. I usually add a few more dashes along with a bit more sea salt and black pepper. Then, serve yourself a generous mound of that cheesy goodness and get cozy. 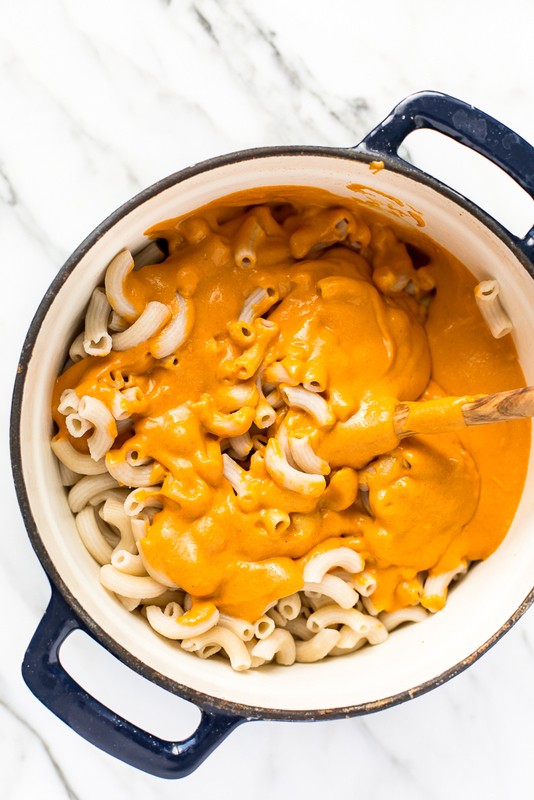 Heaps of warm elbow pasta are coated in a simple, homemade, and plant-powered smoky vegan cheese sauce. The "cheese" is made by blending together raw cashews, a bit of filtered water, roasted red peppers, nutritional yeast, arrowroot starch (for thickening), apple cider vinegar, smoked paprika, s + p, and a dash of hot sauce (if you're feeling feisty). The mixture is heated for just a few minutes, or until its hot, bubbly, and thickened into a rich cheese sauce. Then, simply spoon it over the pasta, stir to coat, and serve. That's it. 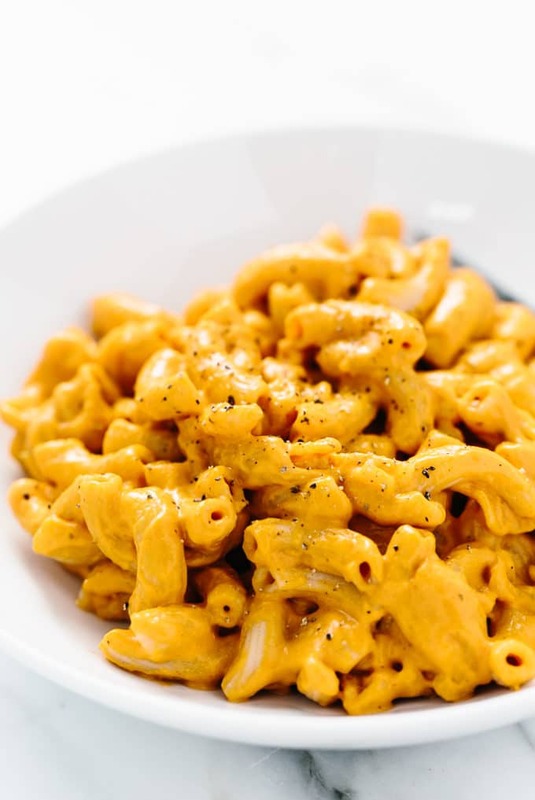 Simple vegan homemade mac 'n' cheese in 30 minutes flat! Bring a large pot of salted water to a boil. Add the pasta and cook until al dente and drain, reserving 1 cup of the pasta water. Return the pasta to the pan. 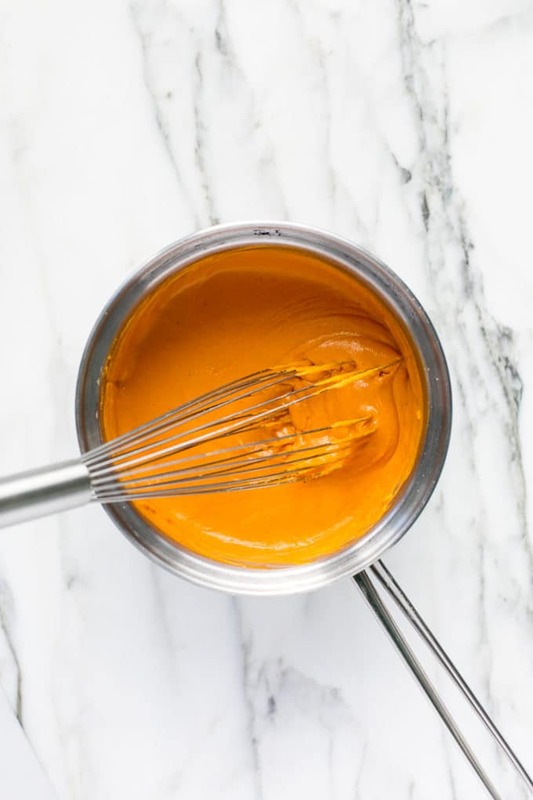 Meanwhile, make the Smoky Cashew Cheddar Cheese by adding the soaked and drained cashews, filtered water, roasted red peppers, nutritional yeast, arrowroot, apple cider vinegar, smoked paprika, sea salt, black pepper, cayenne (if using), and hot sauce (if using) to a high-speed blender. Blend on high for 2 to 3 minutes or until completely smooth, stopping to scrape down the sides as needed. Once the pasta is ready, pour the Smoky Cashew Cheddar Cheese mixture into a medium saucepan. Heat over medium for 5 minutes or until very thick and just shy of stretchy, whisking constantly. Once thickened, immediately turn off the heat to avoid overheating. Arrowroot loses its thickening power if overheated, so be attentive to it. Spoon the cheese over the pasta and toss to coat, adding pasta water, a few tablespoons at a time, as needed to thin the sauce. Season with more sea salt, smoked paprika, and black pepper, to taste. I usually add another 1/2 teaspoon sea salt, another dash or two of smoked paprika, and a few grinds of black pepper; however, seasoning will vary depending on the amount of pasta you used and how salty your pasta water was, so adjust according to your tastes. 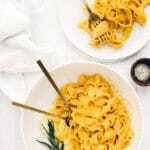 Butternut Squash Mac and Cheese from Food52 Vegan by Gena Hamshaw + A Giveaway! How much nutritional yeast do you use? Maybe I’m overlooking it but I don’t see it on there! Can’t wait to try this! I’d love to know what the nutritional content is — while it’s easy for me to eat half the pan, I’m sure the fat content is high. Do you know serving size? I’ve already made two batches and I’ve never tasted Mac-n-cheese so rich and delicious. This looks delicious! I’m looking forward to making it. Oh yes!! This is the perfect bowl of cheesy deliciousness for these cold winter nights. It hits the perfect level of coziness!! Yes, exactly! Bring on the cheese and the coziness, right? I made this last night for dinner for myself, my boyfriend, and a friend and we all loved it! The red pepper adds a delicious flavor and I love the color it gave the sauce! I ended up adding a couple more tablespoons of nutritional yeast because I can’t resist the extra cheesiness it adds! We served it over brown rice shells because there weren’t any elbow noodles in stock but it was just as delicious! Another hit recipe Ashley! I can’t wait to make this one again! Somehow I’m just seeing your awesome comment, Karissa! I think you have permanent comment approval for my site, so sometimes I miss yours since I don’t have to manually approve them! 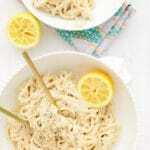 Can you substitute cornstarch for arrowroot? Hi, Melissa! You should be able to substitute cornstarch. You’ll probably need a bit more (maybe 1-2 teaspoons more) because arrowroot is a more potent thickener, and the texture will be slightly different but it will be close enough! Hope this helps! For the roasted red bell pepper, do you deseed and remove the skin? This was my first foray into vegan “cheese” and holy cats is it amazing (and easy)! Thanks for a fantastic recipe. I sautéed red chard with onions and added, along with fresh, chopped tomatoes. Delicious sauce, thanks! So happy to hear it was a hit, Guinevere! I saw your comment come through the other day and it planted the craving for the dish, so I actually made it again (for like the 20th time this year—eek!) last night. Isn’t the smoked paprika something else in the cheese sauce? Really offers it a flavor *oomph*! Thanks for taking the time to come back and share your thoughts—I really appreciate it. 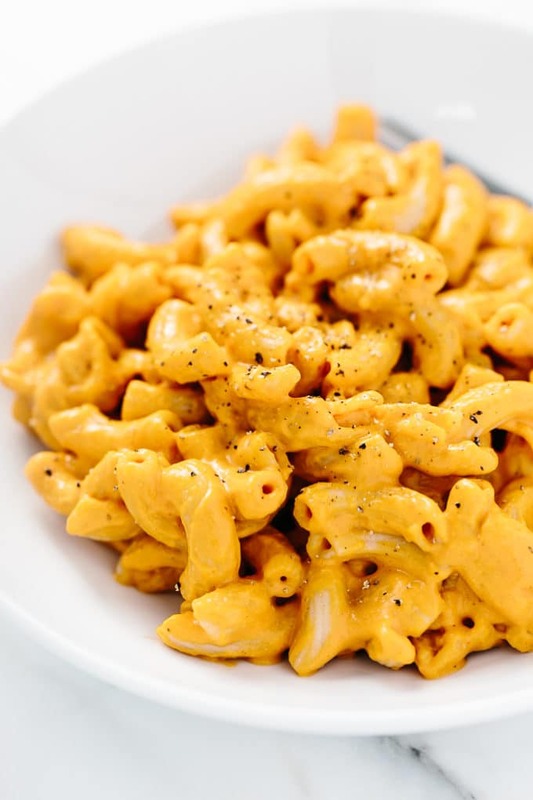 I’ve been trying out a ton of vegan mac and cheese recipes since I went vegan, and this is BY FAR HANDS DOWN HONEST TO GOD THE BEST RECIPE !!! I’ve been loving your vegan/gf peanut butter cookies and I want to try this recipe next! I have a question about this one: Are you roasting your own peppers, or is it okay to use the ones that come in a jar? Thanks! That was the answer I was hoping for! Thanks for the quick reply. Can’t wait to make this this weekend! Are you using the store bought roasted peppers that are in oil or the ones that are in more of a brine/vinegary type solution? Just curious as I want to make this but too lazy to roast my own, haha! I see that Ashley already replied but I’ll chime in too and say that I also use the ones in brine (not oil). I usually end up adding a bit more than the recipe calls for, just because. I also add a bit more smoked paprika and about twice as much nutritional yeast. This has quickly become one of my favorite recipes! 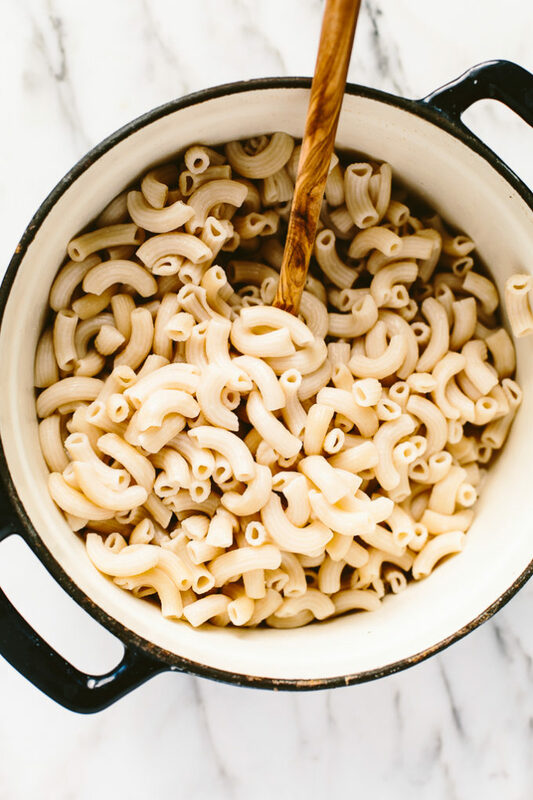 I’ve made this numerous times and had to drop in to let you know….This is by far the BEST Mac and Cheese I have ever had…. vegan or otherwise. Thank you for such a delicious recipe!! Can you use paprika instead of smoked paprika? I tried to make this for thanksgiving and the sauce came out grainy with little bits of cashew chunks everywhere. :( The flavor is nice but the texture did not turn out well. I used a food processor instead of a blender because my blender isn’t very good. Is that what caused the grainy texture? Hello in the process of making it now and mixed everything up and ready to add it to the pasta and wondered why the nutritional yeast was still sitting here! I reread it 5 times looking for when to put it in. I finally found it by the pictures but it doesn’t mention by the recipe section. Also I read in the comments about deseeding and peeling the pepper which I didn’t do since it wasn’t in the recipe part. Please change that for future use! I always scroll down and get straight to a recipe and never bother with all the stuff on top cause I’m usually really hungry! Thanks! Hi, Danielle! Thanks for catching the missing nutritional yeast from the method. I recently switched to a new recipe plugin and have had some issues with the way it converted recipes. Not sure if that was the problem or I somehow missed it from the beginning. Either way, corrected now. I used jarred roasted peppers which are already peeled and seeded, which is why it wasn’t noted in the recipe. Added now. Wow! 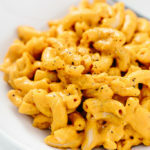 This is by far the best vegan Mac and cheese recipe I have made! I enjoyed it very much! This was delicious!! I omitted the red pepper and arrowroot since I didn’t have any (and believe it or not I was also out of regular flour), and the sauce thickened beautifully on its own! I just added 1 cup less water to a double sauce recipe, so 0.5 cup less for one recipe. Also added an extra tbs of nooch. I ended up using all the double recipe of sauce for the amount of pasta listed… maybe it made less sauce with my changes. Finally, I would add a little less vinegar and taste if you need more, because it was a little too vinegary for me. Overall an excellent tasty recipe, will definitely make again! Thanks for sharing your feedback and adjustments, Jessica! When reducing the amount of water and omitting the peppers and arrowroot, you’ll definitely want to adjust the other seasonings (vinegar included) to accommodate because those are some fairly significant changes. I’ve made this recipe several times. Vegan macaroni and cheese recipes are iffy. I’m always scared to try them because I never know if they are going to turn out (they usually don’t) and then you risk wasting ingredients if it isn’t good. But I love this recipe, it’s my go to! I usually up the nutritional yeast to make it even cheesier. I made this tonight and it is absolutely delicious! One of my new favorites hands down! So glad you’re enjoying it, Laura! Thanks for taking the time to come back and rate the recipe and offer your thoughts—means so much. Wow!!!! I’m guilty of craving that velveeta boxed Mac n cheese with the foil sauce packets and this totally hit the spot in the same way and I mean that as the hugest compliment. Followed the recipe to a tee and then added a dash of Cholula hot sauce. BRILLIANT. Seriously good. Happy to hear you’re enjoying this recipe, Shawn! And thank you for taking time out of your day to come back and share your thoughts and rating—means a lot to me and is helpful for others wanting to make the recipe, too. This looks delicious! How does it reheat? Like if I made it tonight for dinner would it be good tomorrow for lunch? I just have to add that I just discovered your site… and I want to make literally everything! Hi, Carolyn! So glad you’re enjoying the site! This reheats well! It won’t be as creamy as it is when it’s first made (more of a baked Mac ‘n Cheese vibe upon reheating, if that makes sense), but I enjoy the leftovers just as much as when it’s freshly made. Hope this helps, and enjoy!